LOL Our Grandchildren, they bring such sunshine in our lives! Truly a blessing from the Lord! And put perverse lips far from you. And your eyelids look right before you. Remove your foot from evil. Guarding our eyes, our feet, our hearts, our tongues.....Today's devotion was on guarding our feet... How important it is to take the path that God has chosen for us. The path may look level and safe to us, but God sees things differently. His ways are higher than ours, His thoughts are higher than ours... What may appear to our eyes to be the level, safe path, may be riddled with pit falls and quick sand that the enemy has put in front of us. Following God's path does not mean taking the "safe" road or the comfortable path but means to follow God and heed His wisdom and trust HIS guidance no matter how "crazy" or "silly" it may seem to the outside world..... Betsie ten Boom said "The center of God's will is our only safety." My gleaning, especially from today's devotion is this: "When you seek a direction for your life, give no attention to whether your path is safe or risky, conventional or unconventional. Consider only whether it is based in God's truth, sensitive to His voice and reflecting HIS purposes as revealed in His Word. This is ultimately the only safe, level, firm way there is." And meditating on all of this reminded me of my dear friends testimony. K is the sweetest person that anyone could know. Truly a sweetheart all of her life. When she got saved many of her friends asked What sin?? K, you are always so kind and good! And this bothered her because yes, it was true, she was a good person, but that goodness could not get her into heaven and she struggled for a testimony! So many of her saved friends had powerful testimonies and hers didn't seem to have much "oomph." One day it came to her. K's house sat on a beautiful island in the Puget Sound and her front windows looked on the water. How she loved to watch the water. Looking straight thru K's windows everything appeared beautiful and perfect. But when you moved and looked at an angle thru the glass, the view was distorted and corrupted. Suddenly it hit her! That was HER life. To the world, she appeared a good and perfect person, but our Holy God saw her through PERFECT eyes. 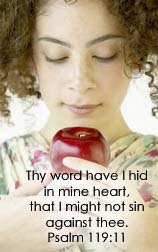 When he saw her without Jesus, He saw the distorted, corrupted, sinful person that she was. But behold the salvation thru Christ and she was made new! Our lives can be like that. The choices we make in our everyday life may appear to be good. But what does God say? What does He see there? When we have salvation, we have the mind of Christ... He thru prayer, the reading of His Word and the meditation of our communion with God will help us to make the right decisions as to what we allow our eyes to see, what we allow our hands to do, where we allow our feet to go and what factors we allow into our hearts. Oh and what we SAY! That is tomorrows devotion! :) But an important one also. I just love the Lord. I am far from perfect, far from where I want to be in my relationship with Him. But I want, DESIRE to follow Him. So how do I pull this all together? How do I guard all these things? I believe it starts with prayer. Prayer is not the LEAST I can do, it is the FIRST thing I SHOULD do! I was noticing my Pastor's Bible in church the other morning. I noticed that it was getting well worn. I remember when he got it just about 4 years ago and he commented on it because the pages were difficult to turn, etc. :) And now just a few short years later, it has become used, a familiar friend to him. I look at my Bibles over the years. The worn covers, the notes in the margins, the inspirational poems taped to the inside covers, missionary cards glued in as prayer reminders. There are ripped pages, where I carelessly left it out and my dear handicapped daughter picked it up and tore it (not meaning to!) The comfort of the old Bible, picking it up and easily finding a familiar passage... and I look at my newest Bible. I am in the process of making a cover for it...The pages are "sticky", I struggle to find passages..... And I wonder... What will my Bible look like in 4 years? I don't want torn pages but I want it to be well worn! Not neglectfully worn but worn with familiar use. Worn because I have treasured hearing what my Savior has to say to me. Oh I fall so short!! But this is the desire of my heart - to have a closer walk with my Lord... and we know that He grants the desires of our heart. As a child, I was taught that the Bible was important. That no book should be placed on top of it. As a Believer, I have never heard that being taught in our churches, although today, if I see a book on top of a Bible, I will without fuss, quietly readjust so the Bible is on top. I don't think God cares about that. I think what God cares about is that it doesn't stay at the bottom of the pile neglected... because that Book represents our relationship with Him. We seek wisdom in the Words there. We seek guidance in our everyday life as well as the crisis that come into our lives. 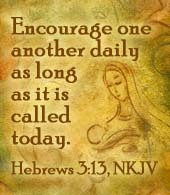 It is how God communes with us. It is where our mind is stimulated to ask questions that only He can answer. Yes, I don't want my new Bible to look as good in 4 years from now as it does for now. I want it to be well worn from love and respect and friendship with my Savior. I want it to fit comfortably in my hands and for the pages to move freely and with familiarity! Indoor Hopscotch Mat Tutorial - CLEVER!!! 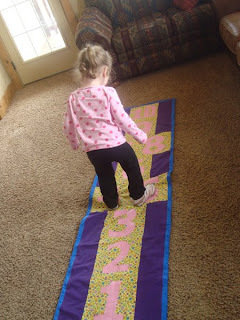 Happy to Craft blog has this adorable and clever hopscotch mat tutorial on her blog. Please check it out and check out the rest of her blog while you are there. I think you will come away a happy crafter! My Dancer with the Stars!